Rewards programs are nothing new. Buy 10 frozen yogurts and you get the next one free with your punch card. 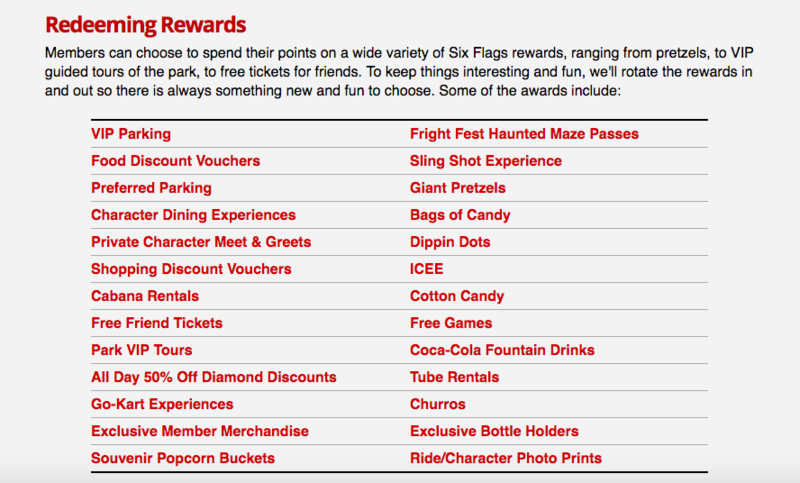 Now for the first time, Six Flags has their own rewards system. There are many ways to gain points including seeing shows, buying merchandise and simply riding attractions. The Six Flags Rewards program is exclusively for their members (annual passholders). Let’s take a look at what it entails! 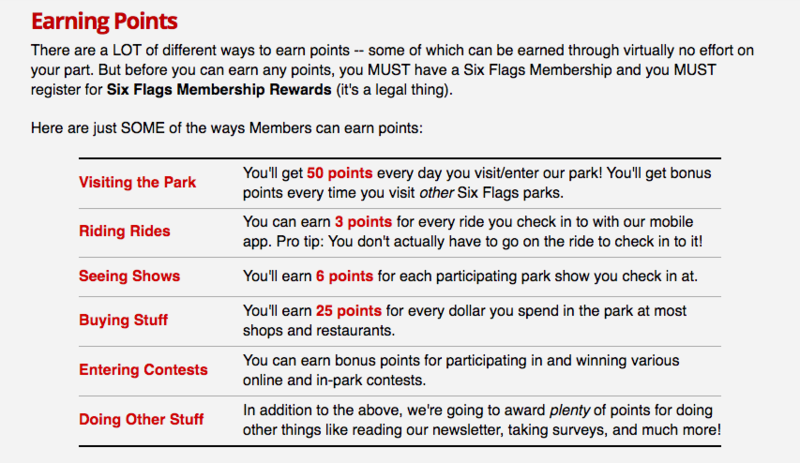 According to Six Flags, there are a lot of ways to earn membership rewards. Simply by entering a Six Flags park? That’s 50 points. Seeing a show? You’ll earn six points. Riding an attraction? You rack up three points per ride. Plus you’ll earn 25 points for every dollar you spend at most restaurants and shops. In addition, Six Flags plans to announce even more ways to earn points in upcoming months including taking surveys. What can you redeem Six Flags rewards points on? It looks like just about anything. Free parking, food and drink, VIP Tours, upcharge attractions like the Slingshot and a lot more. Now what has yet to be released is how many points each of these items or experiences might cost. If I had to take a guess, it may vary by market and park as the cost of a Coca-Cola isn’t the same depending on where you buy it. Regardless, how do you feel about the new Six Flags Rewards program? Does it make you more likely to buy an annual pass from Six Flags? If you are already an annual passholder, do you feel like you’d spend more time in the park if you knew you could rack up points for free stuff? I’d love to hear your thoughts on this as it is a first-of-its-kind in the industry. This entry was posted in Theme Parks 101 and tagged Rewards Program, Six Flags, Six Flags Rewards. Bookmark the permalink. Trackbacks are closed, but you can post a comment.